A friend of mine was speculating what linked this morning’s Gospel reading to Father’s Day. I hasten to add that you wouldn’t expect it to, but anyway... 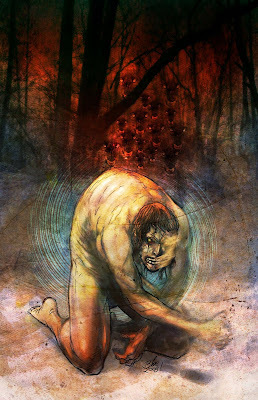 The link between the demon possessed man this morning’s Gospel reading and Father’s Day is that he was driven out of his mind and he wouldn’t go home... until he was commanded to at least!... Da, dum, tish! The city of Geresa is to the south east of the Sea of Galilee, in what would have once been an area with predominantly Jewish settlers but by the time of Jesus it was pretty mixed. There was a huge Roman city called Jerash in the area, and presumably the swine were to feed the Romans. I am intregued by Luke’s little aside that the man was under guard and bound in chains. This man was as incarsarated as he could be, and yet the demon or the man or both long to be free - the man occasionally breaks the bonds and runs out of the city into the wild - the spiritual realm, the realm of angels and demons. The liberation that the man is offered by the demon is only a pale imitation of what Jesus offers them both - liberation. Another interesting thing to note is that Jesus asks, presumably the demon, it’s name. Legion. Two final thoughts. Firstly, I do believe in demons as spiritual entities in a Biblical sense, but also I believe that demons can be a spiritual expression of the reality of the world. Our lives can be completely consumed, obsessed by, addicted to any number of different things physically but their impact is so often felt spiritually, at our core, in our hearts. This morning’s Gospel reminds us that Jesus longs to liberate us from the things which bind and possess us and with which we demonize each other whether that’s attitudes, politics, habits or substances. God longs to free us to be the people he made us to be - named as his beloved sons and daughters.